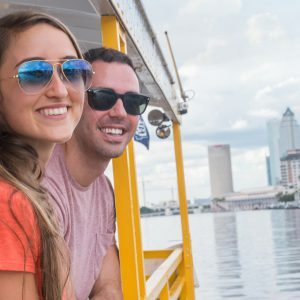 Enjoy the Pirate Water Taxi Downtown Route all year, become an Annual Passholder today! 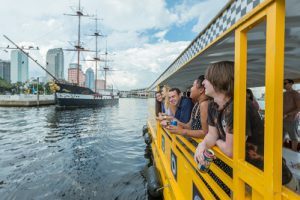 Bring visiting guests or family with you to enjoy the water taxi without having to buy their ticket! Annual passes are valid for one (1) year from the date of purchase. Annual Pass Card – you will receive one (1) card per household. Passholders must be 16 years of age or older and have a valid ID. Please be prepared to present your annual pass card (with a photo ID) at the ticket booth or on board the water taxi at any of the stops. The name on the ID must match the information on your annual pass card. 2-Pack Annual Pass allows admission for primary cardholder plus one guest. 4-Pack Annual Pass, primary and secondary cardholders are limited to members of a single household (1 card per household with primary and secondary names on the card). 4-Pack Annual Pass allows admission for cardholder plus three guests. The passholder named on your annual pass card MUST be present each time your annual pass is used. *Annual passes do not guarantee water taxi admission, especially during high attendance periods. All boats board on a first come, first serve basis. Admission and availability are subject to capacity limitations and other closures. Other restrictions may apply.